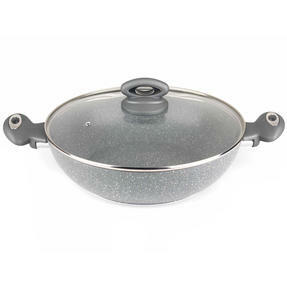 This multi-functional and practical Salter Marblestone wok is ideal for cooking large family meals. Featuring a unique cooking surface made from a high performance marble non-stick coating, you can prepare healthier meals using little or no oil. 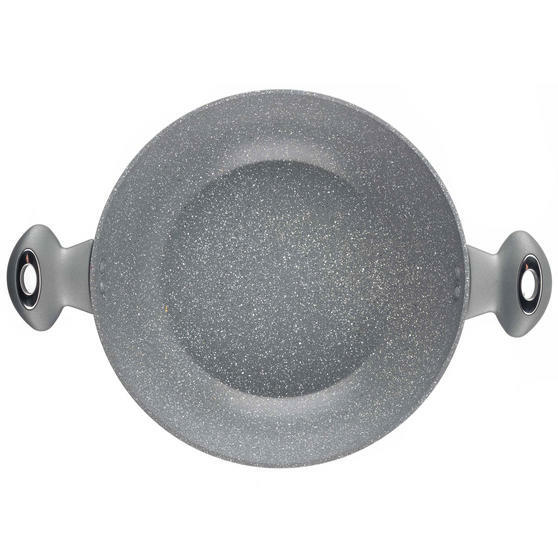 Crafted from four layers of PFOA free materials with two soft-touch side helper handles the wok is delightfully safe and easy to use in a busy family kitchen. 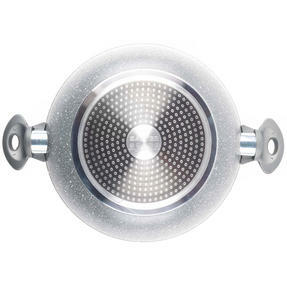 Dishwasher suitable for fast and easy cleaning, this Salter wok is the complete family pan. From the Salter Marblestone Collection, this wok features an ultra-non-stick surface delivering an improved cooking performance. With a tempered glass lid and soft touch TPR Bakelite handles the versatile wok is ideal for making pasta, curry, stews and much more. Measuring 30 x 9 cm, this high-quality and durable wok is made from strong forged aluminium with a smart looking grey marble finish. Suitable for all hob types including induction, the work and lid are also dishwasher safe to suit all kitchens, cooks and abilities.